You can use any spray bottle. I bought one at TJ Maxx on clearance. But you can find them at most dollar stores or your local hardware store. 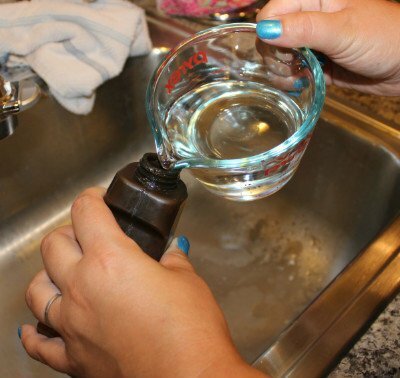 You can even recycle an old empty spray bottle that you have laying around the house. Just make sure you clean it thoroughly before reusing it. I’ve read that you shouldn’t use the grater for food again after you’ve grated the stain stick. Weeelllll… I did. And no one has gotten sick yet, whew! I did run my grater through the dishwasher when I was done. 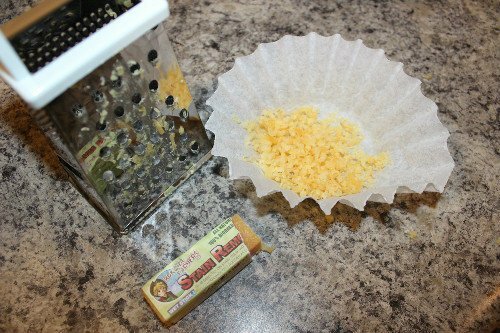 If you are concerned, pick up a grater at the dollar store and designate it as your Buncha Farmers Spray Maker Grater. I don’t keep paper plates in the house, so I used a coffee filter to collect the shavings. That did not work out so well. I’d go with a paper plate so you can just fold it into a funnel when you are ready to pour the shavings into the bottle. If you don’t have one, be prepared to pick up the shavings piece by piece off of whatever you grated the Buncha Farmers onto. That isn’t that hard anyway, but I just wanted to mention it. 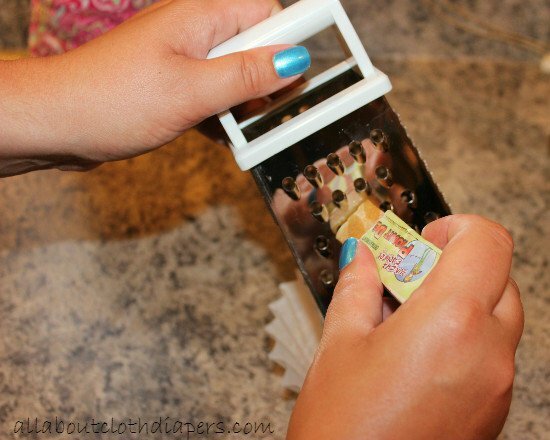 Take your grater and grate about a quarter of the stick onto your paper plate (or whatever you are using). It will take a little work, but nothing crazy. Be sure to clean the back side of the grater as well because there will be shavings stuck behind it and you don’t want to waste any. Get your hot water ready. You can either use HOT tap water or heat some water up a little in the microwave. Boiling water is too hot if you are using a plastic spray bottle (and not necessary anyway). I used my Pyrex measuring cup and heated water to steaming in my microwave. Mine took about 45 seconds to a minute, but the time will vary based on your microwave, so keep a close eye on it. After getting shavings into the spray bottle, pour your hot water in as well. Don’t fill it all the way to the top! Fill to the max capacity line if the bottle has one. If your container has no markings (like mine), fill the container with hot water until about 3/4’s full. Replace the top on the spray bottle. Then…Shake. Shake. Shake. Done! I’ve used the same spray bottle mixture for a few months (until it ran out) with no issues. I’m not aware of an expiration time on the spray but you should be good for at least that long. Give the bottle a good shake before each use. 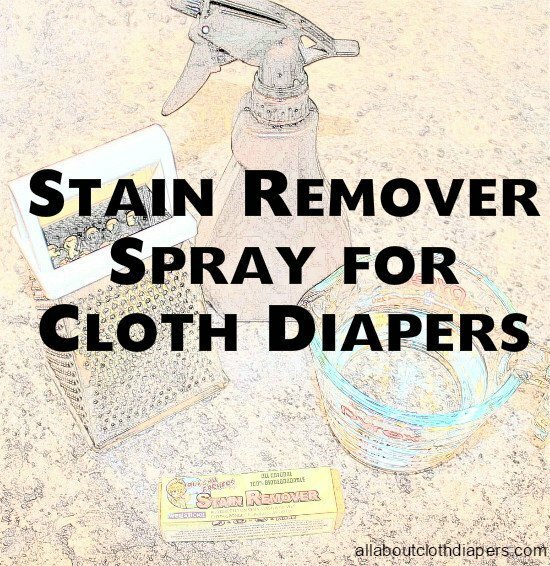 Spray any stains from poo on a cloth diaper to food stains on your kids shirt. You can let it sit and soak or rub in a bit and wash immediately. When I’m fighting a serious stain I scrub with an old tooth brush. 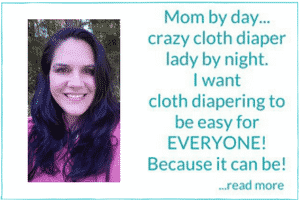 (That can be done on a clean, but stained cloth diaper.) 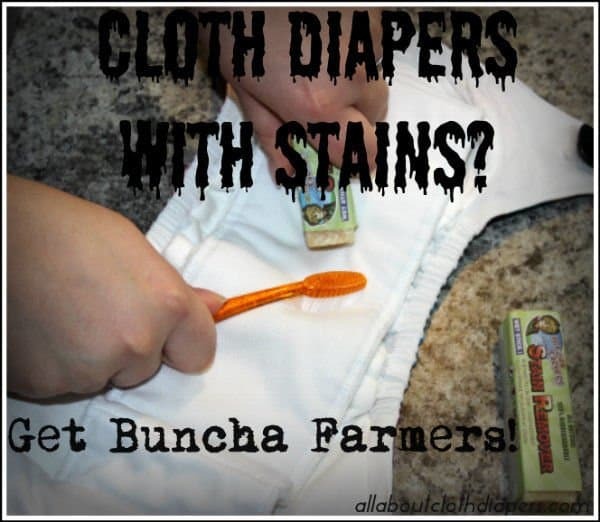 More details on how to use your Buncha Farmers Stain Spray and further uses can be found HERE! in my other Buncha Farmers Stain Remover post. Pin or bookmark this for future reference. Trust me…you won’t regret getting some to try for yourself! You can find Buncha Farmers here. This is great advice . I’m really new to cding and was curious what one could use for stains as it will be winter here once I’m cding and sunning won’t be an option. I really love Buncha farmers! And the spray lasts forever. Carolyn, are you wetting the stick? If not that might be your problem. Try wetting the stain a bit with warm water just until it is damp and then dip the stick in the water and rub the stain. Let it sit for just a few minutes before laundering. 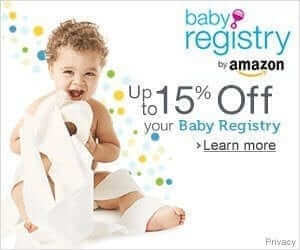 I agree with Jennifer, this product is fantastic! I didn’t even think about the grating part! I think I have a mini heater somewhere. Thanks for the tutorial! The toothbrush idea is a keeper too! Cool – this is a great tutorial, Jennifer! One tip on the spray bottle: I use (thoroughly rinsed) glass Apple Cider Vinegar bottles! You can buy just the sprayer tops on Amazon, at Lowes, etc. Great suggestion Meredith! Thank you! I just made this spray to use on my husband’ s work shirts. We have lots of old Franks Hot Sauce bottles laying around so I used one of those, seems to be working pretty good so far! Awesome! Thanks for sharing Ruth! I give the really bad stains a little scrub with an old toothbrush after spraying. It helps release the stains a little better.